As protests in the Oromia region intensify, TPLF has turned to its security forces once again to silence peaceful citizens. Unlike the uprising that followed the stolen 2005 Ethiopian elections, brute force seems not sufficient to crush the Oromo protests once and for all this time. Initially, the protests started over the “master plan”, which the protesters assure will displace millions of Oromo farmers. Throughout the peaceful protests thus far, there have been over 150 Ethiopians massacred by TPLF forces. These massacres took the forms of: indiscriminate shootings into peaceful demonstrators, bombings of Universities, and individually targeted killings perpetrated by ethnically loyal cadres of the TPLF- the core leading party of the so called “EPRDF” coalition. 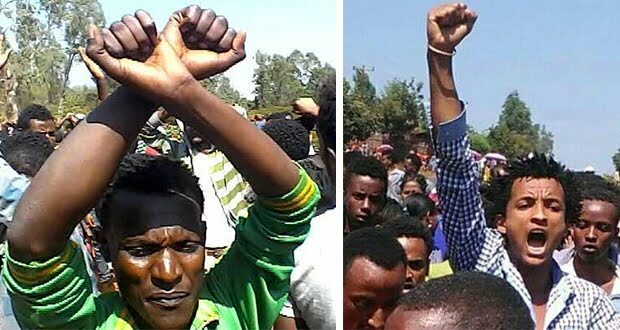 Throughout the continuing protests of Ethiopians in the Oromia region, chants against the undemocratic, minority ethnic apartheid of TPLF have been widely heard. These protests are tantamount to the quest towards change, democracy and justice sought during the Arab Spring and it is the moral duty of the West, mainly the United States to support the aspirations of the Ethiopian people as they are intertwined with the values of America. Since the inception of the protests in the Oromia region, TPLF has intensified arrests of prominent opposition leaders and journalists and has revived its subtle killings and mass disappearance. Recently, the government has antagonized the Oromo Federalist Congress (Opposition) and has begun arresting, killing, intimidating, and making their members disappear. During such times of despair, TPLF is infamous in creating imagined enemies, which it uses to create and broadcast propaganda through the government controlled national TV station, which is the only option for many in Ethiopia. TPLF then attempts to justify the arrests of opposition members and independent journalists as those working with the Eritrean government and armed opposition groups based in Eritrea. Since the two-year border war with Eritrea in 1998-2000, TPLF has painted Eritrea as an “arch enemy” and has used that card to support and justify its dictatorial rule and suppression of dissent. The fact remains that there are many Ethiopian armed opposition groups based in Eritrea. Some of these armed groups are led by those who have exhausted all peaceful means for change and democracy such as professor Berhanu Nega at one hand and defected military officials such as General Kemal Gelchu at another who has witnessed ethnic prejudice within the army. Patriotic Ginbot 7, the armed opposition group that professor Berhanu Nega leads has been a focal target of the TPLF led government by the mere fact that it has garnered the support of countless Ethiopians at home and in the diaspora. Reason being, the government works tirelessly to transmit baseless propaganda against this armed opposition group. Through inhumane detention and torture, opposition leaders and journalists are made to “admit” and “confess” to working with Patriotic Ginbot 7 and the Eritrean government to terrorize Ethiopians and destroy infrastructure on national TV. However, if there is one thing that Ethiopians have learned through the 24 years under such deceptive dictatorship, it is not to believe anything told by this notoriously deceptive government. To Ethiopians, the debate of whether this regime is democratic or not, elected or not or has the potential to be is tantamount, to a certain degree, of an absurd debate on whether Hitler killed millions of Jews or not. That debate is finished. The Ethiopian people have already solidified their stance against this regime time and time again. Western powers, without closely understanding the then political organizations led by Meles Zenawi, Yoweri Museveni and their likes began praising and calling them “brand of new generation leaders.” In 1991 TPLF, a minority party that stood for Tigrayan ethnic supremacy seized power in Ethiopia through an armed struggle. Such ethnic supremacy is exemplified by the fact that from a genitor high up to Meles Zenawi, to key military leaders, all Agazi Special Forces, judges, prosecutors, most leaders of the Federal Police and at least half of the bureaucracy are ethnic Tigrayan who are members of TPLF. The bureaucracy operates with a remote control under such ethno-fascist minority brute party members. Ethiopia today has no justice in absolute terms. There is no formal, reliable, and trustworthy petitioning to government officials since all are partisan to the minority party. One can easily lose ones life by extrajudicial killing, either through abduction or via daylight execution. Tesfaye Tadesse, a lawyer, opposition, and former member of the Ethiopian Peoples Revolutionary Party (EPRP) is one such example. Tesfaye was slaughtered by TPLF members in front of his home in Gerji, Ethiopia. Others, such as Assefa Maru, former secretary general of the Ethiopian Human Rights Council was shot multiple times by TPLF security forces while on his way home. This does not include the countless of massacres they conducted even before seizing power, while in armed struggle, which includes members of EPRP. Inhumane torture is the order of day under this regime. Arbitrary detention is frequent. One can lose his property in a very simple mechanism; ones business license is revoked under any pretext. The TPLF led EPRDF government did not only kill humans, but also Ethiopia. They have committed treasonable acts by dismembering the country and recently by secretly paving the way to grant Ethiopian territory to the Sudan as a reward. Amidst their Albanian type communist inclination and glaring crimes of genocide and generally against humanity, their pseudo elections and general mockery of Ethiopians and the international community have all resulted in Tony Blair to regret having supported such an organization. Others also have followed suit but failed to force such a fascist establishment to relinquish authority. Similarly, the leader they praised in Uganda then is still in power heading an authoritarian regime. Today, as we are witnessing the struggle for change in the Oromia region, decades worth of silence through fear has turned into anger and this anger has completely lost its fear of arrest, torture, and even death. Millions of Ethiopians are seeking change; millions of Ethiopians are asking the United States, Great Britain and other European Union members to stand firmly to support the Ethiopian people unconditionally as they struggle towards building a democratic, just, stable and united Ethiopia. This Ethiopia is one that will continue to play a key role in stabilizing the East African region. This new Ethiopia will work closely with any party to fight terrorism, especially that found in its neighbor- Somalia. The fear of losing a key ally in the region has been the base in which America and the West stood on to support such a repressive regime; the time is near for this regime to be thrown out of power through an armed struggle and civil disobedience and thus the time has come for the west to switch its support in favor of the Ethiopian people publicly.